Background: We aimed to prospectively validate a novel 1-hour algorithm using high-sensitivity cardiac troponin T measurement for early rule-out and rule-in of acute myocardial infarction (MI). Methods: In a multicentre study, we enrolled 1320 patients presenting to the emergency department with suspected acute MI. The high-sensitivity cardiac troponin T 1-hour algorithm, incorporating baseline values as well as absolute changes within the first hour, was validated against the final diagnosis. The final diagnosis was then adjudicated by 2 independent cardiologists using all available information, including coronary angiography, echocardiography, follow-up data and serial measurements of high-sensitivity cardiac troponin T levels. Results: Acute MI was the final diagnosis in 17.3% of patients. With application of the high-sensitivity cardiac troponin T 1-hour algorithm, 786 (59.5%) patients were classified as “rule-out,” 216 (16.4%) were classified as “rule-in” and 318 (24.1%) were classified to the “observational zone.” The sensitivity and the negative predictive value for acute MI in the rule-out zone were 99.6% (95% confidence interval [CI] 97.6%–99.9%) and 99.9% (95% CI 99.3%–100%), respectively. The specificity and the positive predictive value for acute MI in the rule-in zone were 95.7% (95% CI 94.3%–96.8%) and 78.2% (95% CI 72.1%–83.6%), respectively. The 1-hour algorithm provided higher negative and positive predictive values than the standard interpretation of highsensitivity cardiac troponin T using a single cut-off level (both p < 0.05). Cumulative 30-day mortality was 0.0%, 1.6% and 1.9% in patients classified in the rule-out, observational and rule-in groups, respectively (p = 0.001). In a pilot study, a novel high-sensitivity cardiac troponin T 1-hour algorithm was shown to allow accurate rule-out and rule-in of acute MI within 1 hour in up to 75% of patients.11 This algorithm is based on 2 concepts. First, high-sensitivity cardiac troponin T is interpreted as a quantitative variable where the proportion of patients who have acute MI increases with increasing concentrations of cardiac troponin T.6–15 Second, early absolute changes in the concentrations within 1 hour provide incremental diagnostic information when added to baseline levels, with the combination acting as a reliable surrogate for late concentrations at 3 or 6 hours.6–15 However, many experts remained skeptical regarding the safety of the high-sensitivity cardiac troponin T 1-hour algorithm and its wider applicability.16 Accordingly, this novel diagnostic concept has not been adopted clinically to date. Because the clinical application of this algorithm would represent a profound change in clinical practice, prospective validation in a large cohort is mandatory before it can be considered for routine clinical use. The aim of this multicentre study was to prospectively validate the high-sensitivity cardiac troponin T 1-hour algorithm in a large independent cohort. The Advantageous Predictors of Acute Coronary Syndromes Evaluation (APACE) Study, an ongoing prospective study being conducted internationally in multiple centres, is designed to advance the early diagnosis of acute MI.8,11,13,15 Unselected patients presenting to the emergency department with nontraumatic chest pain or other symptoms suggestive of acute MI are enrolled after written, informed consent is obtained. For this analysis, 1714 patients enrolled after the initial pilot study were eligible. These patients were enrolled at 6 centres in 3 countries (Switzerland, Spain, Italy) from June 2009 to June 2013. To further increase the generalizability of the findings, the recruitment network was changed as compared with the first phase of the APACE Study:8,11,13,15 2 new centres were initiated, and 2 centres were closed because the local principal investigators left those centres. The onset or maximum severity of chest pain had to be within the last 12 hours before presentation. Patients with terminal kidney failure requiring dialysis were excluded. The study was carried out according to the principles of the Declaration of Helsinki and approved by the local ethics committees. Patients with ST elevation MI (n = 58) were excluded from this analysis, because cardiac biomarkers are considered to be of limited clinical value in these patients. Among the remaining 1656 patients, samples at presentation and after 1 hour for measurement of high-sensitivity cardiac troponin T were available in 1320 patients. The most common reasons for missing values after 1 hour (n = 336) were early transfer to the catheter laboratory or coronary care unit, and diagnostic procedures around the 1-hour window that precluded blood samples being drawn at 1 hour, but did not preclude follow-up samples being drawn in the future. Baseline characteristics were similar in patients with and without a sample after 1 hour (Appendix 1, supplemental table 1, available at www.cmaj.ca/lookup/suppl/doi:10.1503/cmaj.141349/-/DC1). All patients underwent a clinical assessment that included medical history, physical examination, 12-lead ECG, continuous ECG monitoring, pulse oximetry, standard blood test and chest radiography. Levels of cardiac troponin were measured at presentation, serially after 3 and 6 hours, and thereafter as long as clinically indicated. Timing of tests and treatment were left to the discretion of the attending physician. Adjudication of the final diagnosis was performed centrally in a core laboratory at the Universitätsspital Basel. The adjudication also included later levels of high-sensitivity cardiac troponin T to take advantage of the higher sensitivity and higher overall diagnostic accuracy offered by these assays.7–15 This allowed the additional detection of small acute MIs that would be missed by the adjudication based on conventional cardiac troponin assays. Two independent cardiologists reviewed all available medical records pertaining to the patient from the time of emergency department presentation to 90-day follow-up. Data from the medical records included patient history, physical examination, results of laboratory testing (including serial high-sensitivity cardiac troponin T levels), radiologic testing, ECG, echocardiography, cardiac exercise test, lesion severity and morphology in coronary angiography. Late samples were available for adjudication of the final diagnosis in all patients. In a minority of patients with a low pretest probability for an acute MI, serial sampling was stopped, at the discretion of the attending physician and in accordance with current guidelines from the European Society of Cardiology, once a second sample 3 hours after presentation to the emergency department was again negative.3 In situations of disagreement about the diagnosis, cases were reviewed and adjudicated in conjunction with a third cardiologist. Acute MI was defined and cardiac troponin levels interpreted as recommended in current guidelines.2,3,5,6 In brief, acute MI was diagnosed when there was evidence of myocardial necrosis in association with a clinical setting consistent with myocardial ischemia. Myocardial necrosis was diagnosed by at least 1 cardiac troponin value above the 99th percentile together with a significant rise and/or fall.2,3,5,6 The criteria used to define rise and/or fall are described in detail in Appendix 1 (available at www.cmaj.ca/lookup/suppl/doi:10.1503/cmaj.141349/-/DC1). After hospital discharge, patients were contacted after 3, 12 and 24 months by telephone or in written form. Information regarding death was obtained from the national registry on mortality, the hospital’s diagnosis registry and the family physician’s records. Continuous variables are presented as means ± standard deviations, or as medians and interquartile ranges; categorical variables are presented as numbers and percentages. Differences in baseline characteristics between patients with and without acute MI were assessed using the Mann–Whitney test for continuous variables and the Pearson χ2 test for categorical variables. Receiver operating characteristic (ROC) curves were constructed to assess the diagnostic accuracy for the diagnosis of acute MI for high-sensitivity cardiac troponin T levels at presentation and the combination with absolute changes in levels within the first hour and within the first 2 hours after presentation. The comparison of areas under the ROC curves was performed as recommended by DeLong and colleagues.19 Mortality during 30 days and 2 years of follow-up according to the classification provided by the algorithm was plotted in Kaplan–Meier curves, and the log-rank test was used to assess differences in mortality between groups. All hypothesis testing was 2-tailed, and p values < 0.05 were considered significant. All statistical analyses were performed using SPSS for Windows 19.0 (SPSS Inc.) and MedCalc 9.6.4.0 (MedCalc Software). Among the 1320 patients who presented to the emergency department with acute chest pain (Table 1), the adjudicated final diagnosis was acute MI in 229 patients (17.3%), unstable angina in 109 (8.3%), cardiac symptoms of origin other than coronary artery disease in 194 (14.7%), noncardiac symptoms in 732 (55.5%) and symptoms of unknown origin in 56 (4.2%). 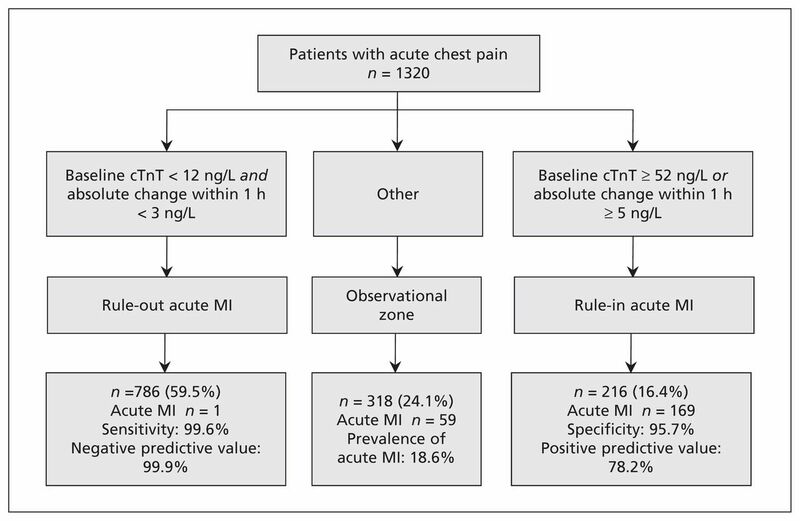 With application of the high-sensitivity cardiac troponin T 1-hour algorithm, 786 (59.5%) patients were classified as “rule-out,” 216 (16.4%) were classified as “rule-in” and 318 (24.1%) were classified in the “observational zone” (Figure 1). The sensitivity and the negative predictive value for acute MI in the “rule-out” zone were 99.6% (95% CI 97.6%–99.9%) and 99.9% (95% CI 99.3%–100%), respectively. The negative predictive value was comparable in various subgroups, including patients who presented early after the onset of chest pain (Appendix 1). The algorithm missed only 1 patient, an older woman who was a current smoker and had hypertension and dyslipidemia and who presented early with a small acute MI. Her initial high-sensitivity cardiac troponin T level was 10 ng/L, rose to 12 ng/L after 1 hour and later reached a peak of 17 ng/L. Performance of the high-sensitivity cardiac troponin T (cTnT) 1-hour algorithm for rapid diagnosis of acute myocardial infarction (MI). For the rule-in zone, specificity and positive predictive value for acute MI were 95.7% (95% CI 94.3%–96.8%) and 78.2% (95% CI 72.1%–83.6%), respectively (Figure 1). Of 229 patients with acute MI, 169 (73.8%) were ruled-in after 1 hour. The final adjudicated diagnosis of the ruled-in patients with a diagnosis other than acute MI (n = 47) were cardiac arrhythmia (n = 17), myocarditis (n = 6), pulmonary embolism (n = 5), acute heart failure (n = 3), Takotsubo cardiomyopathy (n = 3), unstable angina (n = 1), hypertensive crisis (n = 1) and noncardiac chest pain (n = 11). Taken together, the algorithm allowed for a definite diagnosis after 1 hour in 75.9% of patients (either rule-in or rule-out). The remaining 318 (24.1%) patients were classified in the “observational zone,” and 59 of these patients were finally classified as having acute MI, reflecting a prevalence of acute MI of 18.6% in the observational zone group. A single cut-off value for high-sensitivity cardiac troponin T (14 ng/L) at presentation resulted in a sensitivity and negative predictive value of 92.1% (95% CI 88.4%–95.3%) and 98.1% (95% CI 96.5%–98.6%), and a specificity and positive predictive value of 79.4% (95% CI 76.3%–81.3%) and 48.4% (95% CI 43.3%–53.3%), respectively. Measures for diagnostic accuracy of different cut-off points of high-sensitivity cardiac troponin T are shown in Table 2. Combining the classic interpretation of cardiac troponin with ischemic ECG findings (ST elevation, ST depression, T inversion and complete left bundle branch block), the combination of both a normal high-sensitivity cardiac troponin T level and no ischemic ECG findings at presentation had a sensitivity and negative predictive value of 95.2% (95% CI 91.6%–97.6%) and 98.6% (95% CI 97.5%–99.3%), respectively. “Rule-in” defined as either one (or both) being positive had a specificity and positive predictive value of 69.8% (95% CI 67.0%–73.0%) and 39.9% (95% CI 35.7%–44.1%), respectively. The area under the curve for the combination of high-sensitivity cardiac troponin T at presentation with 1-hour absolute change (0.96, 95% CI 0.95–0.97) was significantly higher as compared with the area under the curve of high-sensitivity cardiac troponin T at presentation alone (0.93, 95% CI 0.92–0.95), and comparable to the combination of high-sensitivity cardiac troponin T at presentation with 2-hour absolute change (0.96, 95% CI 0.95–0.97). The mean duration of follow-up was 24.4 ± 10.1 months. There were 9 deaths within 30 days (0.7%) and 74 deaths within 24 months (5.6%). Mortality was significantly associated with the categories “rule-out,” “observational zone” and “rule-in” as classified by the high-sensitivity cardiac troponin T 1-hour algorithm (Figure 2A). Cumulative 30-day mortality was 0.0%, 1.6% and 1.9% in patients classified as “rule-out,” “observational zone” and “rule-in,” respectively (log-rank p = 0.001). This pattern continued to a follow-up of 2 years with cumulative all-cause mortality of 1.1%, 16.5% and 13.4% in patients classified as “rule-out,” “observational zone” and “rule-in,” respectively (log-rank p < 0.001) (Figure 2B). Kaplan–Meier curves showing cumulative mortality within 30 days (A) and 2 years (B) of follow-up according to the classification into “rule-out” (n = 786), “observational zone” (n = 318) and “rule-in” (n = 216) as determined by the high-sensitivity cardiac troponin T 1-hour algorithm. This international multicentre study, performed to prospectively validate the high-sensitivity cardiac troponin T 1-hour algorithm for rapid rule-out and rule-in of acute MI, had 6 major findings. First, the negative predictive value for acute MI in the rule-out zone defined only by high-sensitivity cardiac troponin T levels at presentation and the absolute change within 1 hour was 99.9%. Overall, 59.5% of all patients could be assigned to the rule-out category. Although the achieved negative predictive value is extremely high, it is important to stress that the high-sensitivity cardiac troponin T 1-hour algorithm should always be used in conjunction with full clinical assessment, including patient history and examination, and 12-lead ECG. Second, the positive predictive value for acute MI in the rule-in zone was 78.2%. Many of the patients in the rule-in zone with a diagnosis other than acute MI did have conditions that usually still require coronary angiography for accurate diagnosis, including Takotsubo cardiomyopathy, myocarditis and unstable angina.2,3 Therefore, the immediate clinical consequence of being assigned the rule-in zone would be urgent coronary angiography, unless clinical assessment would indicate another obvious condition associated with acute cardiomyocyte damage (e.g., heart failure, tachyarrhythmia or hypertensive crisis).2,3 The rule-in zone of this algorithm is more precisely defined in the 2011 European Society of Cardiology algorithm.3 Because the rule-in of acute MI in patients with mild elevations in high-sensitivity cardiac troponin is often challenging for clinicians,5,6 it is a key advantage of this 1-hour algorithm to provide more detailed guidance in this difficult setting. Third, accordingly, the negative predictive value, but particularly also the positive predictive value, of the high-sensitivity cardiac troponin T 1-hour algorithm is significantly higher than that achieved by the current standard of care (classic interpretation of high-sensitivity cardiac troponin T with or without ECG findings). Fourth, our data confirm the selection of the 1-hour time point, as the diagnostic accuracy for high-sensitivity cardiac troponin T and its changes were higher at 1 hour than at presentation only and comparable to that of the 2-hour time point. It is important to highlight that the 1-hour time point did not provide a definite answer in all patients (about 24.1% remained in the observational group). Accordingly, later time points (e.g., 3 or 6 h) still remain necessary in some patients. Fifth, the 1-hour algorithm overall assigned 75.9% of patients a definite process (either rule-out or rule-in). Thereby, the high-sensitivity cardiac troponin T 1-hour algorithm was even more effective in the early triage of patients with acute chest pain than, for example, the recently developed accelerated diagnostic protocol combining the Thrombolysis in Myocardial Infarction Score with high-sensitivity cardiac troponin levels at baseline and 2 hours, or the dual-marker approach combining high-sensitivity cardiac troponin with copeptin, which assign 20%–40% of patients for rapid rule-out.20–27 This difference is at least partly explained by the fact that the latter approaches exclusively select patients for rule-out, but do not provide guidance for rule-in. Sixth, cumulative 30-day mortality was 0.0% in patients assigned the rule-out zone, further documenting the safety of this approach and the suitability of many of these patients for early discharge. Due to the poor harmonization among different cardiac troponin assays,3,6,12 the results of this study cannot be directly extrapolated to other assays. Several ongoing studies are currently developing similar assay-specific 1-hour algorithms with other sensitive and high-sensitivity cardiac troponin assays. As some of these assays have been shown to have similar diagnostic accuracy at presentation as high-sensitivity cardiac troponin T,6–15 it is likely that they will achieve a similar overall performance. The medical implications of accelerated rule-in include more rapid initiation of antiplatelet, anticoagulant and anti-ischemic medication, as well as more rapid transfer to coronary angiography and, if feasible, coronary revascularization.2,3 The medical implications of accelerated rule-out include more rapid relief of patient anxiety and more rapid identification of an alternative cause of acute chest pain without the need for continued rhythm monitoring. The clinical application of the high-sensitivity cardiac troponin T 1-hour algorithm may also lead to substantial economic benefits. It will help to correct the disproportional and inappropriate use of resources in the emergency department.4,6,29 We hypothesize that the algorithm has the potential to reduce the time to discharge from the emergency department by about 50%. Of course, this hypothesis needs to be tested in dedicated cost-effectiveness studies. Second, our study involved patients presenting to the emergency department with symptoms suggestive of acute MI. Additional studies, for example, involving patients presenting to a general practitioner, are required to learn whether this algorithm would also be safe and effective in patients with lower pretest probability. Fourth, one quarter of the cohort had to be excluded from the analysis because of missing values after 1 hour. Even though baseline characteristics were similar in patients with and without a sample after 1 hour (Appendix 1, supplemental table 1), we cannot exclude a selection bias. Fifth, we used one specific high-sensitivity cardiac troponin assay for validation of the algorithm. Different sensitive and highly sensitive assays vary considerably with regard to the amount of patients detected with elevated troponin levels. We hypothesize that similar algorithms can be developed for other high-sensitivity cardiac troponin assays,34 but this first requires similar derivation and validation in patients with chest pain. This rapid strategy incorporating high-sensitivity cardiac troponin T baseline values and absolute changes within the first hour substantially accelerated the management of suspected acute MI by allowing safe rule-out as well as accurate rule-in of acute MI in 3 out of 4 patients. The authors thank the patients who participated in the study, the emergency department staff and the laboratory technicians of all participating sites for their valuable efforts. The authors also thank Fausta Chiaverio, Kathrin Meissner, Esther Garrido, Federico Peter, Joaquim Gea, Miquel Sánchez, Beatriz López-Barbeito, Susanne Ernst and Stefan Steuer for help with data acquisition. Competing interests: Tobias Reichlin reports grants, personal fees and nonfinancial support from Roche Diagnostics during the conduct of the study. Òscar Miró reports personal fees from Novartis, and grants from Novartis, Orion Pharma and Thermo Fisher. He was an expert consultant to Novartis and Cardiorentis, and he participated in research projects partially supported by Bayer and BRAHMS, none of them directly related to the present study. Christian Mueller reports grants, personal fees and nonfinancial support from Abbott, Beckman Coulter, BRAHMS, Roche, Siemens, Alere, AstraZeneca, BG Medicine, bioMérieux, Cardiorentis, Eli Lilly and Novartis. No competing interests were declared by the other authors. The high-sensitivity cardiac troponin T assay was donated by Roche, which had no role in the design of the study, the analysis of the data, the preparation of the manuscript, or the decision to submit the manuscript for publication. Contributors: Tobias Reichlin, Raphael Twerenbold and Christian Mueller contributed to the conception and design of the study. All of the authors contributed to the acquisition, analysis and interpretation of data. Tobias Reichlin, Raphael Twerenbold and Christian Mueller drafted the manuscript, which all of the authors revised. All of the authors gave final approval of the version to be published and agreed to act as guarantors of the work. Funding: The study was supported by research grants from the Swiss National Science Foundation, the Swiss Heart Foundation, the Cardiovascular Research Foundation Basel, Abbott, Beckman Coulter, BRAHMS, Roche, Siemens, and the Universitätsspital Basel.
. National Hospital Ambulatory Medical Care Survey: 2005 Emergency Department Summary. Adv Data 2007;386:1–32.
. 2012 ACCF/AHA focused update incorporated into the ACCF/AHA 2007 guidelines for the management of patients with unstable angina/non-ST-elevation myocardial infarction: a report of the American College of Cardiology Foundation/American Heart Association Task Force on Practice Guidelines. Circulation 2013;127:e663–828.
. ESC Guidelines for the management of acute coronary syndromes in patients presenting without persistent ST-segment elevation: The Task Force for the management of acute coronary syndromes (ACS) in patients presenting without persistent ST-segment elevation of the European Society of Cardiology (ESC). Eur Heart J 2011;32:2999–3054.
. Emergency department and office-based evaluation of patients with chest pain. Mayo Clin Proc 2010;85:284–99.
. How to use high-sensitivity cardiac troponins in acute cardiac care. Eur Heart J 2012; 33:2252–7.
. Hospital laboratory reporting may be a barrier to detection of ‘microsize’ myocardial infarction in the US: an observational study. BMC Health Serv Res 2013;13:162.
. Early diagnosis of myocardial infarction with sensitive cardiac troponin assays. N Engl J Med 2009;361:858–67.
. Sensitive troponin I assay in early diagnosis of acute myocardial infarction. N Engl J Med 2009;361:868–77.
. Serial changes in highly sensitive troponin I assay and early diagnosis of myocardial infarction. JAMA 2011;306:2684–93.
. One-hour rule-out and rule-in of acute myocardial infarction using high-sensitivity cardiac troponin T. Arch Intern Med 2012;172:1211–8.
. Direct comparison of high-sensitivity-cardiac troponin I vs. T for the early diagnosis of acute myocardial infarction. Eur Heart J 2014;35:2303–11.
. Early diagnosis of acute myocardial infarction in the elderly using more sensitive cardiac troponin assays. Eur Heart J 2011;32:1379–89.
. High-sensitivity cardiac troponin in the distinction of acute myocardial infarction from acute cardiac noncoronary artery disease. Circulation 2012; 126:31–40.
. Myocardial infarction rule-out in the emergency department: Are high-sensitivity troponins the answer? : comment on “One-hour rule-out and rule-in of acute myocardial infarction using high-sensitivity cardiac troponin T”. Arch Intern Med 2012;172:1218–9.
. Absolute and relative kinetic changes of high-sensitivity cardiac troponin T in acute coronary syndrome and in patients with increased troponin in the absence of acute coronary syndrome. Clin Chem 2012; 58: 209–18.
. Comparing the areas under two or more correlated receiver operating characteristic curves: a nonparametric approach. Biometrics 1988;44: 837–45.
. Validation of high-sensitivity troponin I in a 2-hour diagnostic strategy to assess 30-day outcomes in emergency department patients with possible acute coronary syndrome. J Am Coll Cardiol 2013;62: 1242–9.
. 2-Hour accelerated diagnostic protocol to assess patients with chest pain symptoms using contemporary troponins as the only biomarker: the ADAPT trial. J Am Coll Cardiol 2012;59:2091–8.
. Comparison of the performances of cardiac troponins, including sensitive assays, and copeptin in the diagnostic of acute myocardial infarction and long-term prognosis between women and men. Am Heart J 2013;166:30–7.
. Copeptin improves early diagnosis of acute myocardial infarction. J Am Coll Cardiol 2010;55:2096–106.
. Incremental value of copeptin for rapid rule out of acute myocardial infarction. J Am Coll Cardiol 2009;54:60–8.
. Copeptin helps in the early detection of patients with acute myocardial infarction: primary results of the CHOPIN trial (Copeptin Helps in the early detection Of Patients with acute myocardial INfarction). J Am Coll Cardiol 2013;62:150–60.
. Early discharge using single cardiac troponin and copeptin testing in patients with suspected acute coronary syndrome (ACS): a randomized, controlled clinical process study. Eur Heart J 2015;36:369–76.
. Multicenter evaluation of a 1h-algorithm in the diagnosis of myocardial infarction using high-sensitivity cardiac troponin T. Presented at the European Society of Cardiology Congress; 2014 Aug. 30; Barcelona, Spain.
. Direct hospital costs of chest pain patients attending the emergency department: a retrospective study. BMC Emerg Med 2006;6:6.
. Rapid exclusion of acute myocardial infarction in patients with undetectable troponin using a high-sensitivity assay. J Am Coll Cardiol 2011;58: 1332–9.
. Incorporation bias in studies of diagnostic tests: how to avoid being biased about bias. CJEM 2008; 10:174–5. Letter by Mueller and Roffi Regarding Article, "Assessment of the European Society of Cardiology 0-Hour/1-Hour Algorithm to Rule-Out and Rule-In Acute Myocardial Infarction"